Dewey Mountain Recreation Center is so accessible, it's practically downtown! Leaving Main Street, turn right on Route 3, toward Tupper Lake. The ski center is on the left, after about a mile. There is ample parking in the large lot. 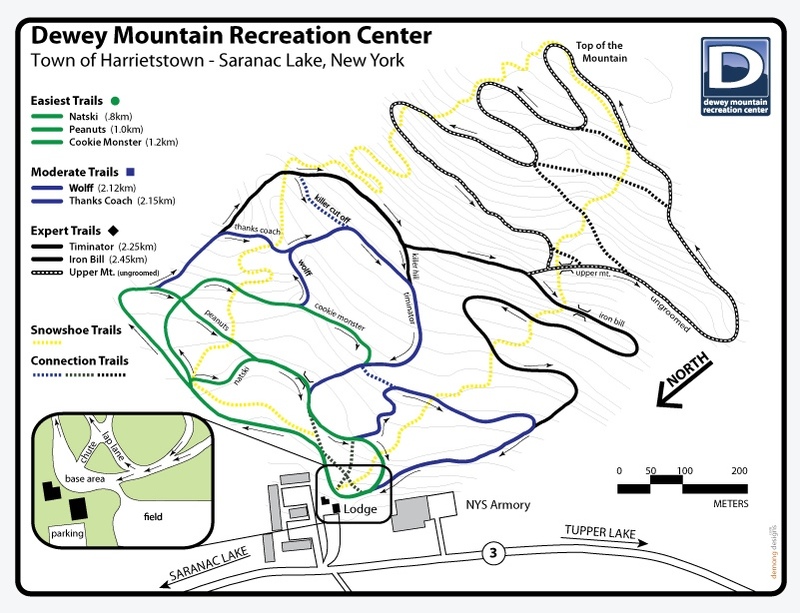 Dewey Mountain's well-marked trails offer a healthy mix of terrain for any level of cross-country skier or snowshoer. If you're just getting your ski legs, stick to the easy, green circle trails along the lower part of the mountain. Once you've mastered the basics — things like turning and stopping — there are more difficult blue square and black diamond trails to explore. Coast along the mid-mountain paths, or test your skills by taking the ungroomed trail to the summit then zigzagging back down. All of the trails are one way, so you'll never have to worry about oncoming traffic, and there are separate paths for snowshoers to follow. No gear? No problem! Rent ski equipment or snowshoes at the lodge. Rental rates are listed below. Snowshoe rentals are available at Dewey Mountain by the day and half-day, and are available for on-premises or off-premises use. Reservations for rentals can be made with a deposit by calling (518) 891-2697. *Off-premises rentals are considered full-day rentals.